New York Democratic Rep.-elect Alexandria Ocasio-Cortez on Sunday compared members of the migrant caravan attempting to enter the United States to Jews fleeing Nazi Germany during the Holocaust. Members of the caravan on Sunday rushed the border at the San Ysidro port of entry, which connects Tijuana, Mexico and San Diego, California. U.S. Customs and Border Patrol closed the port of entry in response and reportedly used tear gas to disperse the crowd of migrants. 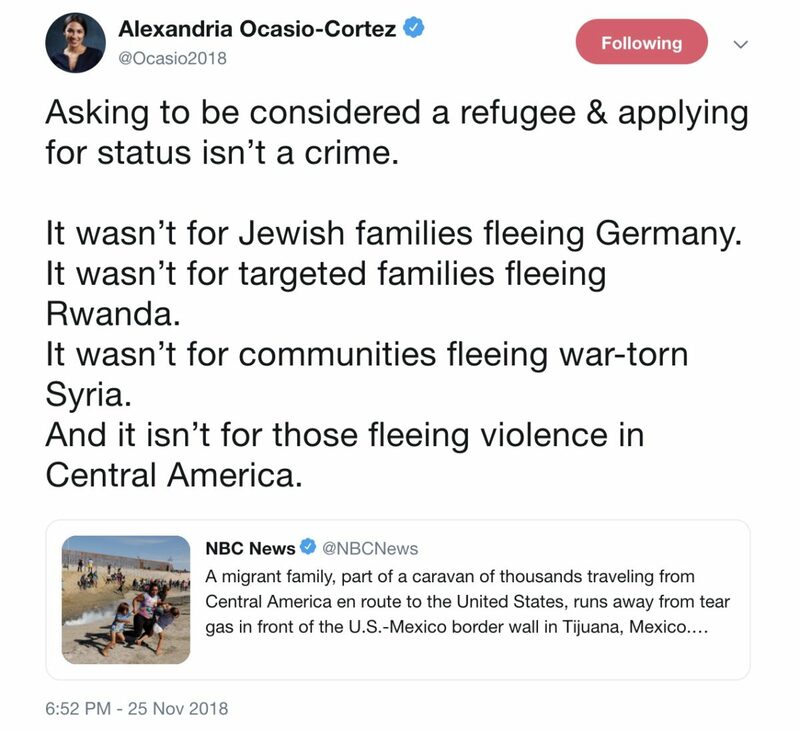 Ocasio-Cortez took to Twitter to denounce the treatment of the caravan members. “Asking to be considered a refugee & applying for status isn’t a crime,” she wrote. “It wasn’t for Jewish families fleeing Germany. It wasn’t for targeted families fleeing Rwanda. It wasn’t for communities fleeing war-torn Syria. And it isn’t for those fleeing violence in Central America,” she added. Some of the caravan members reportedly threw rocks at American authorities before tear gas was used. President Donald Trump in recent weeks has increased pressure on Mexico to do more to stop future caravans before they reach the US-Mexico border.